Reconstruct the I-71/75 interchange at KY 338 (Richwood Road) to a double crossover diamond configuration as recommended in the Kentucky Transportation Cabinet’s Interchange Modification Study to improve safety and congestion (Item Number 06-18.00 and 06-351.10). Widen KY 338 from Triple Crown Boulevard to US 25 (Dixie Highway). Widen US 25 from KY 338 to Winning Colors Drive. Provide grade separation of KY 338 at US 25 and railroad overpass for KY 338. Reconstruction of the interchange will improve congestion and safety for passenger and truck traffic. The two at-grade railroad crossings on Shoreland Drive and Paper Boulevard will be eliminated. The intersection of KY 338 and US 25 will be converted to a grade-separated intersection to improve capacity at this location. The project will improve the TANK access to the existing stops at the KY 338/US 25 intersection. The design phase of this project has been funded. This recommendation will complete the investment in this project. 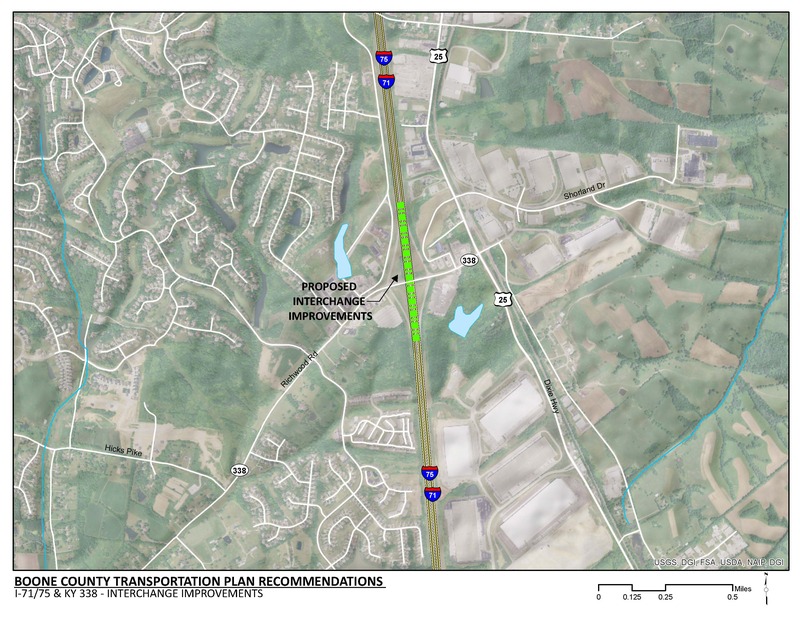 Pedestrian accommodations will provide a multi-modal connection between residential development on Triple Crown Boulevard, the commercial development along KY 338, and the industrial/commercial development east of I-71/75. The multi-use paths proposed along KY 338 are consistent with Boone County’s overall goal of improving bicycle and pedestrian connectivity and safety. Click HERE for a map of multi-use paths in Boone County. Currently, this interchange is significantly congested. As residential development to the west of the interchange and industrial development to the east of interchange continues, increased traffic volumes will continue to degrade conditions in this area. At the signalized intersection of KY 338 and the southbound I-71/75 ramp terminal, the queue of southbound traffic backs onto the mainline of I-71/75, creating a safety and capacity concern. Police officers are assigned to the intersection to help alleviate this issue. There is a cluster of closely spaced access points between I-71/75 and US 25. The KY 338 interchange primarily serves residential development to the west of I-71/75 and industrial development to the east of the interstate. The crash rate along KY 338 within the project limits is over 3.8 times the statewide average for similar roadways. The closely spaced access points between the interstate and US 25 in combination with the congestion are a likely contributing factor to the high crash frequency. There are no existing, dedicated bicycle or pedestrian facilities along KY 338 through the project area. There is a TANK bus stop located at the KY 338 intersection with US 25.